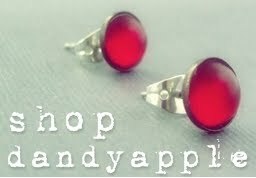 A sample of the fun earrings at the dandyapple shop on etsy. I love how these appear to glow from within. You're right. They do seem to glow. Wonder what they are made of? these are lovely. like deep pools of mystical water. thanks for sharing. Thanks for the comments. They are lucite, SolSisters. Hi there! I found your blog via Entrecard, and these gorgeous blue earrings stopped me in my tracks. SO lovely!!! They do indeed seem to glow. Very pretty - love the color! so glad I popped in fro a visit.. These are lovely. I had the pleasure of buying a pair of your earrings today, by the way.